So I came across some fantastic information about two places to visit when in Poland. Yet again there’s quite some history to these buildings and some of it being rather dark. The first building is The Książ Castle in Wałbrzych. Whats surreal is that its surrounded by the the Waldenburg Mountains , almost as though its right from a fairytale. 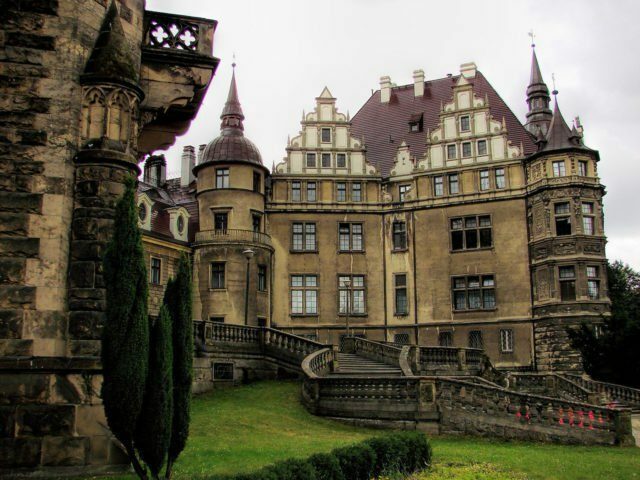 I believe this magnificent castle is situated in southwestern Poland. The castle itself dates back to arounf 1288-92, it was built by the Silesian duke Bolko I aka bolko the Strict (d. 1301) . Get this right – his mums name was Hedwig :’) – CRYING. Anyways he was the ruler in Świdnica and Jawor. 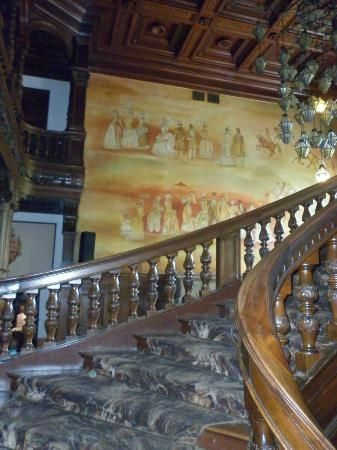 The Hohberg family Purchased the castle in 1508 owning it till 1941. Apparently because the Hohberg family were in debt much of the building was seized by the German state. The castle itself was taken in 1941 as they say it was punishment of the eldest children of Hans Heinrich XV von Hochberghe for committing treason as one served in the British army & the other in the Polish. Nazi’s seized the castle in 1944 and it was to become Hitlers headquarters. They had planned to renovate several rooms with hidden tunnels * there was to be a top-secret Nazi military compound – Thank God the plans didn’t go through. Tunnels – which were apparently dug and worked on by those who were from the concentration camp nearby ! Tragic. Theres far too many distinct architectural structures. 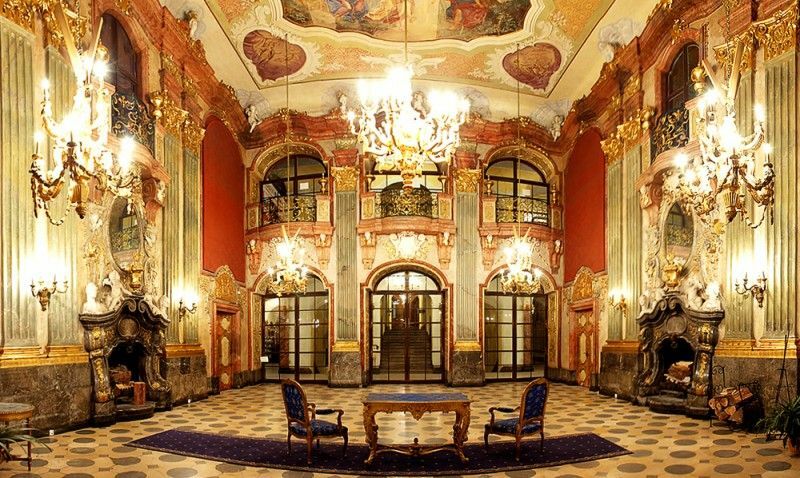 I mean you can see gothic,then you have a baroque feel when you take a look at the Maximilian room which is simply stunning. Do you feel there’s some neoclassical? I’m not quite sure about the last but here’s some pics. Look at the stone on that and the moss and it’s just perfect. 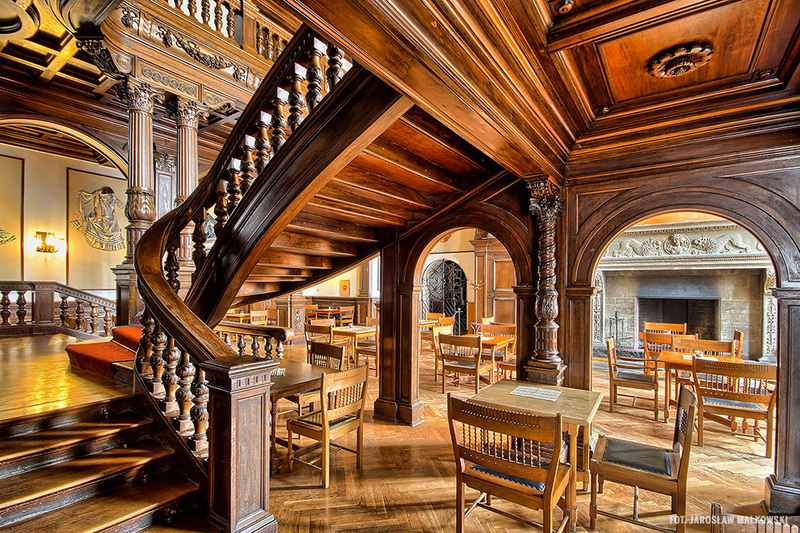 The Maximilian room. I love how they’ve incorporated balconies into the structure which is inside – it’s quite fancy and unique . One of the most stunning things I have ever seen ! This is located in the small village of Moszna. What I love about this castle are the turrets. It gives it such a medieval and archaic feel . Don’t get me wrong this is a really old castle but it feels as though its been there even longer. 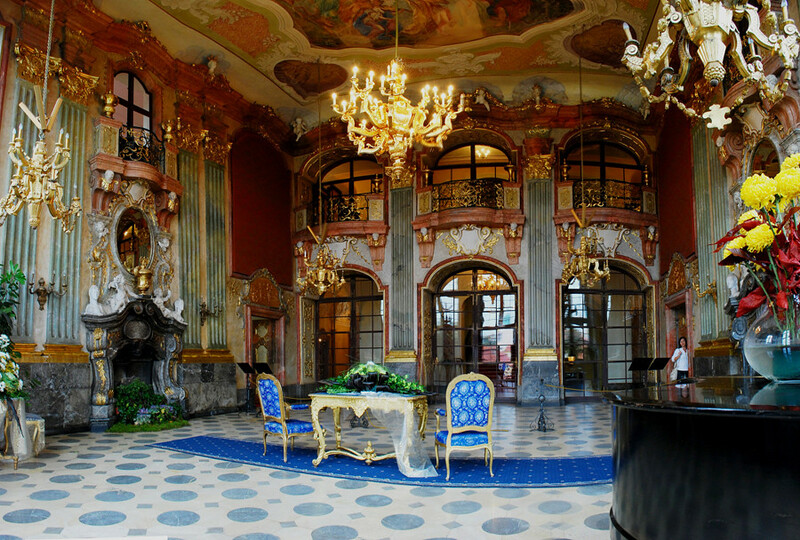 From my research I found out that it was baroque style in some parts but the eastern wing is neogothic. By that I mean spirals, turrets, towers and it just gives that dark and mysterious feel. Like maleficent ooooowwhh. It has 99 towers . The name of the village is derived from the surname of a Moschin family who, at the dawn of the 14th century, bought a large estate and moved there. During those times, the village was part of Łącznik parish, one of the church’s many properties held throughout Europe. However, bearing in mind that all supposed facts from those early days are murky, to say the least, and taking into account that the Order was a secretive organization, this story is hard to confirm. However, investigations that were carried out centuries later found very old cellars buried deep beneath the gardens of the castles, adding a spark of intrigue to a story already rooted in folklore. As the story goes, this family, close to the church, purposely moved there, a village that almost nobody knew existed, to run a monastery and provide shelter for the Knights of the Temple of Solomon. According to local legend, in its early years Moszna was not a castle but a monastery run by the Order of The Knights Templar. This did not last long, as their last leader was burned at the stake in 1314 and the Templars were hunted down, disbanding soon after. Colour of that wood ! Heaven !